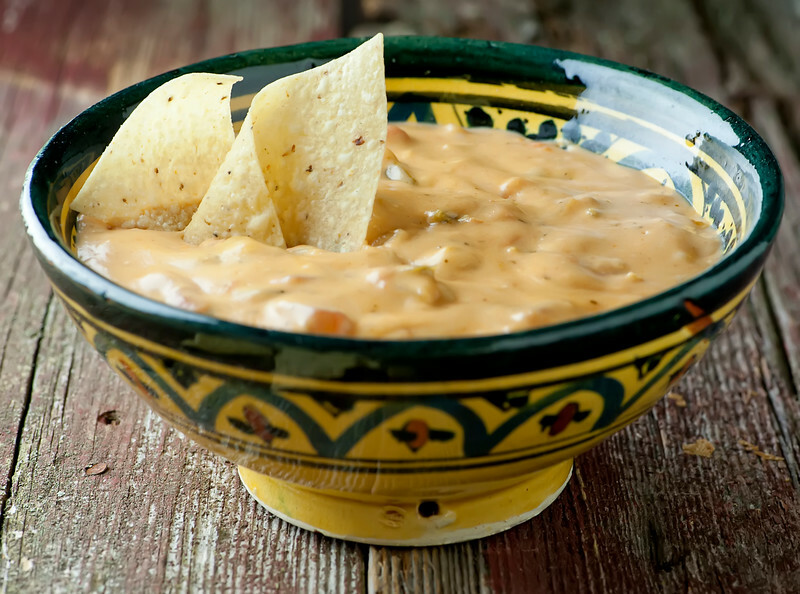 Hot Mexican Cheese dip is delectable any time of year, but since today is Cinco de Mayo, it is practically a requirement that you make and eat this today. It takes all of 20 minutes, and that includes the amount of time it is going to take you to tear open a bag of your favorite tortilla chips. So grab the sangria, head into the kitchen and let’s prepare ourselves properly for a spicy and delicious Cinco de Mayo! One of the things I love about this particular hot Mexican cheese dip is that it is completely customizable, spiciness-wise. The hot sauce goes in at the very end, so you can add as much or as little as you like. I am a spiciness wimp, so I add just a couple of shakes. But be as liberal with your hot sauce shaking as you like…I do recommend tasting as you go, just to make sure you get the right amount. I know, tasting the cheesy, melty dip is a chore, but somebody’s gotta do it. 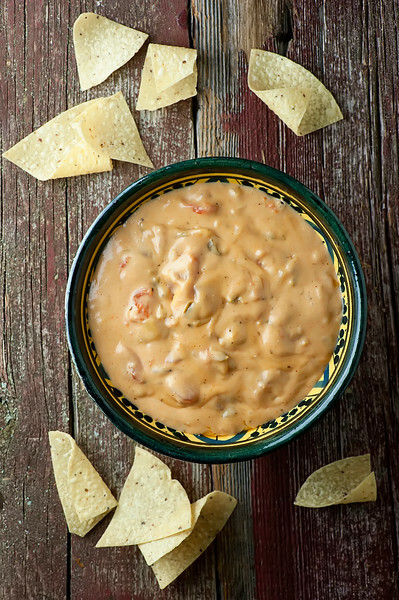 Before you get to the hot sauce part, you will have sauteed onion and tomatoes and green chiles together, and then added a combo of cheddar and cream cheese that will turn the whole thing into a delectable creamy pot of scrumptious. Swirl in that hot sauce and break out the chips. If you think this dip is going to sit around for a while and you have a fondue pot or a chafing dish, that will keep it nice and hot. In our house I just spoon it into a bowl and set it out. Then I turn around and wonder where all the hot Mexican cheese dip that I just made went. So do Cinco de Mayo up! And you might want to do it again on Seis de Mayo. And Seite de Mayo. We can keep this going all summer! This hot Mexican cheese dip recipe is perfect for Cinco de Mayo or any time you want a little spicy cheesy deliciousness! Melt the butter in a saucepan over medium heat. Add onion and cook until tender, about 5 minutes. Add flour and stir until onions are coated. Add chiles and tomatoes and stir. Add cream cheese and stir until melted. Add cheddar and stir until cheddar is melted and everything is creamy. Simmer for about 5 minutes, stirring frequently. Stir in hot sauce a few shakes at a time, tasting after each addition until it is as spicy as you like. Spoon into a bowl or a fondue or chafing dish and serve with chips. In a pinch, Velveeta and a can of Rotel tomato/green chiles,microwave, awesome. But of course! When the cheese dip craving hits, we do what we gotta do! I mean, you had me at hot cheese. The Mexican flavor infusion is just an added bonus! Oh, this stuff is totally my crack. Stick me in front of a vat of this and come back in a couple of hours! It looks completely irresistible. Me TOO. Extremely hard to share when it comes to this one!